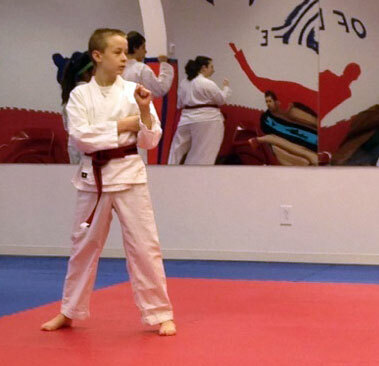 Trevor Weigand would like nothing better than to be a typical 11-year-old boy – hanging out with friends, playing basketball, practicing Tae Kwon Do moves, and working on the Lego city that has been ever expanding at his house. But medical concerns at age 4, followed by a cancer diagnosis at age 5, have complicated that carefree life. 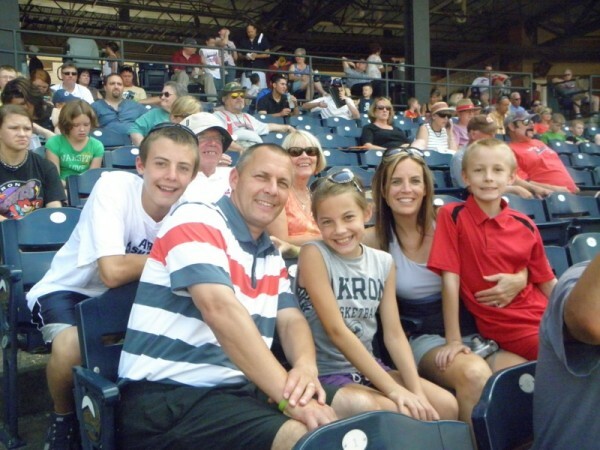 Although Trevor’s parents – Jodi and Terry – and his doctors at Akron Children’s work hard to keep his life as normal as possible, that normalcy has had to revolve around surgeries, chemotherapy, hospitalizations, and numerous appointments and procedures for the past 7 years. The Weigands have had to redefine normal in their house. The Weigands live in Alliance, Ohio, where Trevor is a fifth grader at Marlboro Elementary. Jodi is a physical therapist at Aultman Hospital and Terry is an assistant coach on the University of Akron’s men’s basketball team. Friends – and even strangers – in all 3 communities have rallied to support the family, which includes Trevor’s 16-year-old brother, Trent, and 14-year-old sister, Brittne. In 2006, after becoming concerned about her toddler’s speech development and movement patterns, Jodi took Trevor to several specialists and began early intervention. A mild case of cerebral palsy was suspected. 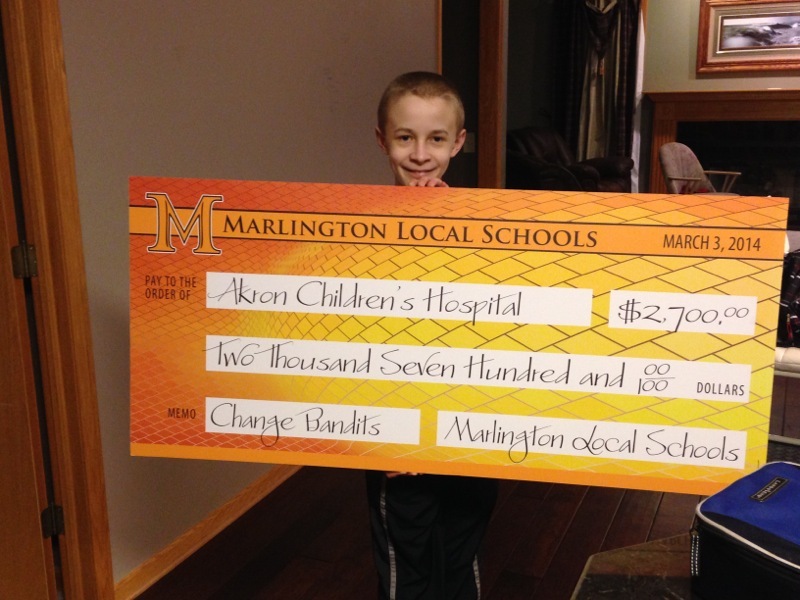 An abnormal MRI prompted Trevor’s pediatrician to send him to pediatric neurosurgeon Henry Bartkowski, who admitted him to Akron Children’s Hospital on a Friday for further testing. Neurosurgery was scheduled for the following Monday. The biopsy came back benign and it was chalked up as a medical mystery. Within months, Trevor began having seizures and the next year was spent trying to manage these seizures. About a year later he had an onset of balance problems with an acute episode of vomiting. His balance got so bad he had trouble sitting up to eat. 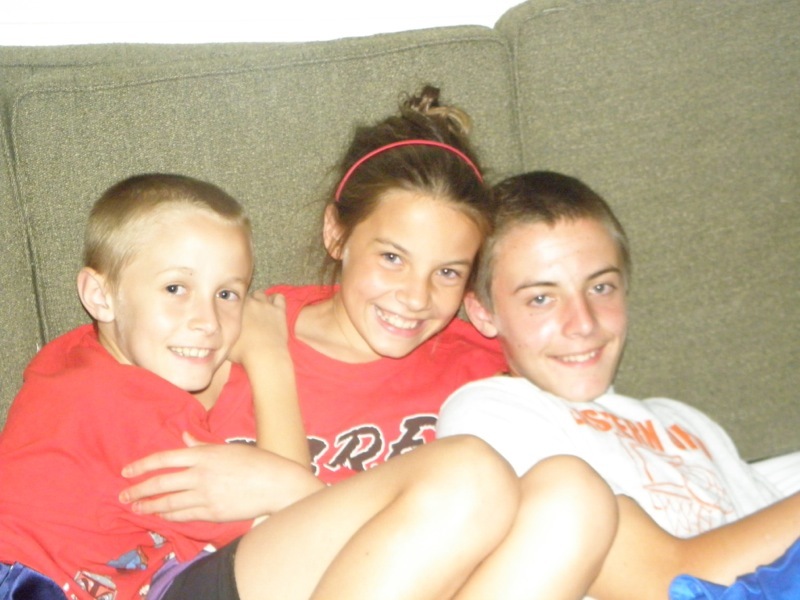 Trevor returned to the hospital for a CT scan, which now showed tumors in the cerebellum and spine. Dr. Bartkowski removed these tumors and diagnosed Trevor with a type of childhood cancer called juvenile pilocytic astrocytoma. Jodi saw Trevor’s age as an advantage. Trevor continued to get MRIs every 3 months. Meanwhile, his pediatric oncologist, Steven Kuerbitz, closely followed the research on Trevor’s cancer. He wrote a journal article about Trevor and consulted with colleagues in other parts of the country also treating children with similar conditions. The new development in fighting astrocytoma was the identification of a protein receptor on the surface of the cell called BRAF. A new chemo used in adults, but not yet approved for use with children, seemed to target this marker. Trevor tested positive for the BRAF marker. “This would be the ace in our pocket,” Jodi said. After years of relative stability on the chemotherapy, an MRI in 2013 showed more changes. Dr. Roger Hudgins surgically removed another tumor on the spine and Dr. Kuerbitz thought it was time to get Trevor into a clinical trial at Cincinnati Children’s Hospital Medical Center using the chemo targeting the BRAF marker. 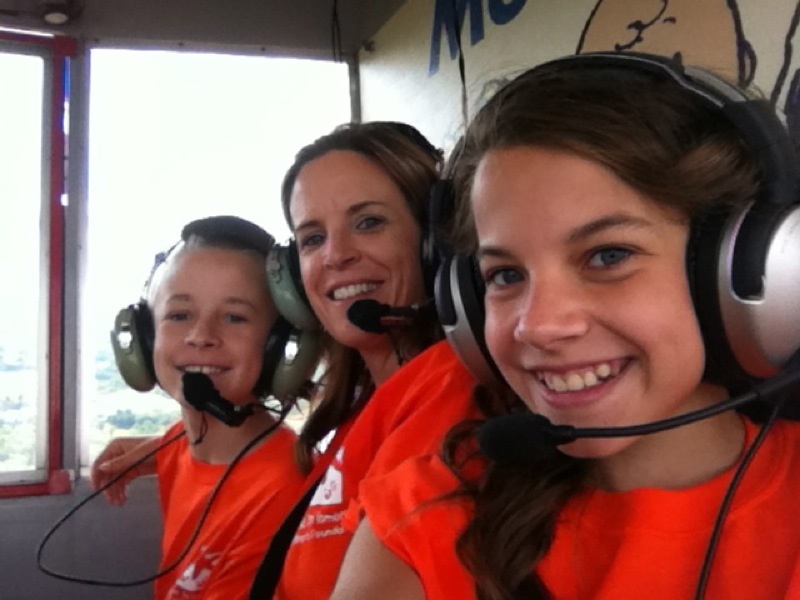 Trevor gets to enjoy a Blimp ride with his mom and sister. Akron Children’s and Cincinnati Children’s recently entered a partnership that gives Akron Children’s patients access to phase 1 and 2 clinical trials while remaining close to home for much of the therapy and maintaining a relationship with their Akron doctors. 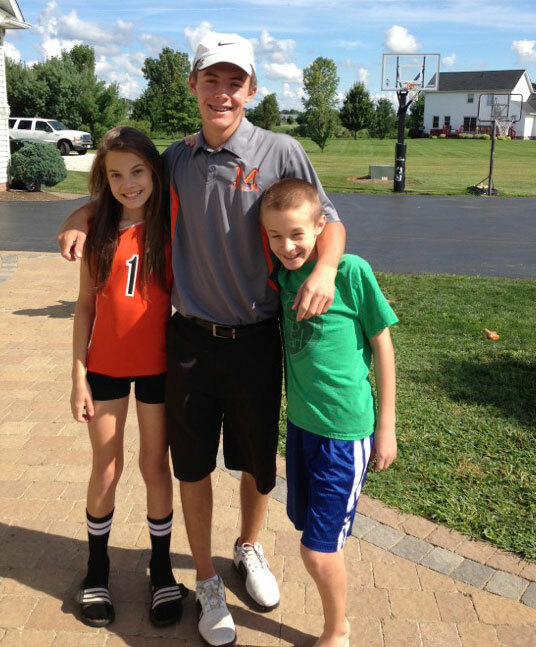 In the fall of 2013, the Weigands took Trevor to Cincinnati for an evaluation as a candidate for the study. Trevor raised $2,700 as a Change Bandit for Akron Children’s Have a Heart, Do Your Part radiothon this year. Dr. Kuerbitz placed calls to his colleagues, noting that while Trevor’s case did not fit the study guidelines perfectly, he had the BRAF marker so he was, genetically, a perfect fit. Study organizers agreed, and changed the protocol to modify the entry criteria. 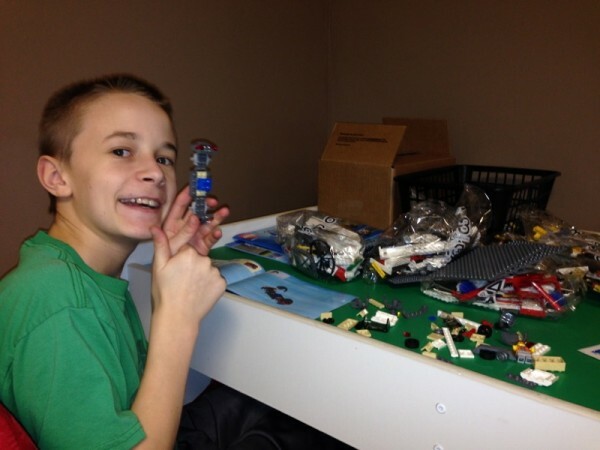 With that – along with continued changes on MRIs – Trevor was eligible for the study. 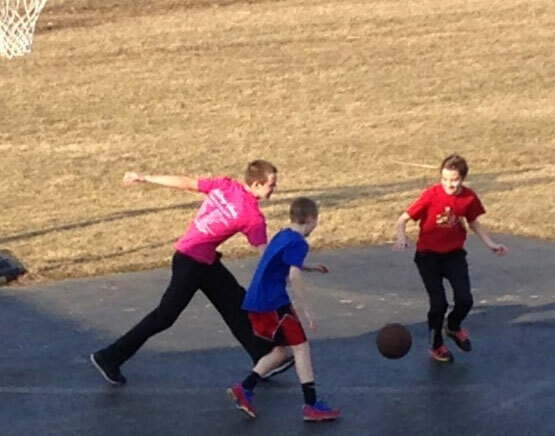 Trevor began the new chemotherapy in February and just finished up his first 4-week cycle. He will have his next MRI in a week.